The DLS series converter/power supply output is so clean and ripple-free, it can be used with or without a battery. The DLS series converter/charger quickly and efficiently charges batteries from the full rated output of the DLS. The DLS then maintains the batteries, only putting into the battery what is required by load or self discharge, cutting back to milliamps as the battery requires. Low and transient AC line voltage can be a major cause of converter/power supply failure. 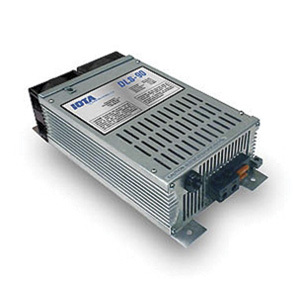 The DLS series converter/power supply is protected against low line voltage, as well as spikes coming from the AC power source or from improperly adjusted generators. When used as a power supply, the DLS model will only supply what is required by the load. When not in use it is essentially off, reducing electricity usage. External fuses can be quickly and easily replaced. Chargers have 120 VAC input. 75-amp and larger chargers have 120V 20-amp plugs. 2-year warranty.